You can create a subdomain/alias name if you already own a domain that works, rather than registering a brand new one. The advantage of doing this is so you can create a second website which holds its own unique pages. Rather than visiting the domain address as www.your-domain.com you can replace the www. with new. making the domain address new.your-domain.com or blog. making the domain address blog.your-domain.com. Under the 'Domains' section, click onto 'Subdomains'. 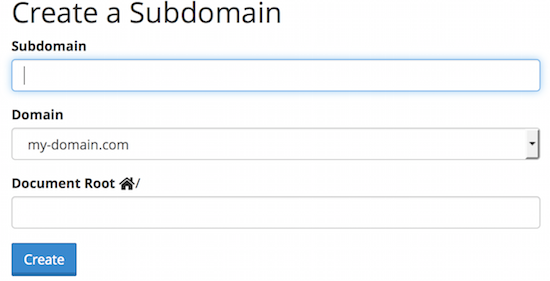 Write your subdomain in the 'Subdomain' box. Please note - if your cPanel account has multiple domains, you will need to choose the right domain that you are looking to add the subdomain to using the drop down box. When you mouse click away from the 'Subdomain' box, the document root will be automatically completed by cPanel. Should you wish to change this, you can do so. Please note - it is recommended that you make a note of the 'Document Root' because this is where you will need to FTP your files to for a site on this subdomain. 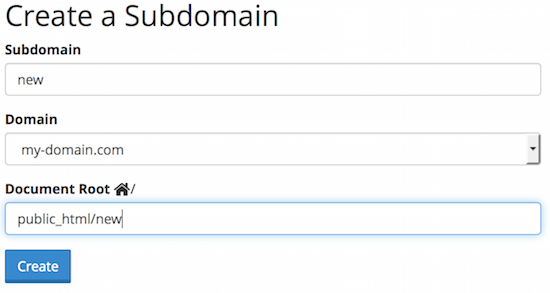 Click 'Create' to complete the subdomain creation. Your new subdomain will have now been created. What’s the difference between Aliases, Addon and Subdomains?